From Matthews grip (MSE) we have BOA BAGS, a versatile, stainless steel shot bag that quickly wraps around the base of any stand column, brace, too handle, arm or boom. 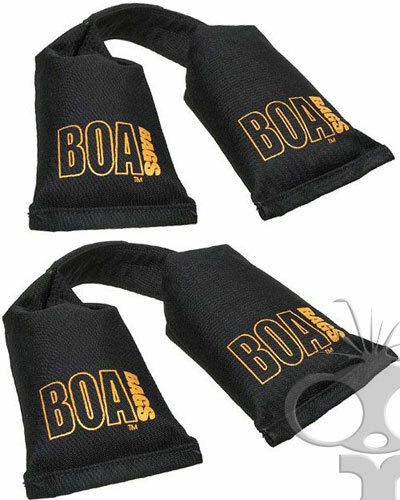 These are the 4.5Kg version - we also have the 6.8Kg (15Lb) Boa bags too. By placing the weight directly below the weight of the fixture, the weight is actually directed straight down the stand's vertical column, holding it firmly in place. The rubber gripper pad wraps around and "sticks" to booms and arms, even at severe angles. The bag's own weight actually increases its holding ability! These little bags are invaluable, preventing lighting stands from toppling over and smashing the light, or giving a tripod or monitor stand a little extra stability.